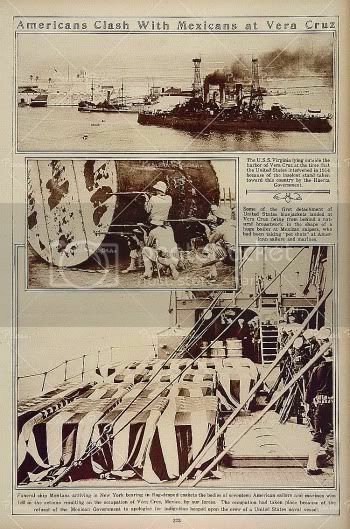 I could tell you all about the occupation of Vera Cruz, how the refusal of a Mexican commander to offer a 21 gun salute to an American naval commander led to a six-month American occupation of the city, how the attempt by Woodrow Wilson to intercept an arms shipment from Germany failed, and the shipment only wound up being diverted to a different port. I could hold all of this up as an example of the follies that led to World War I. But what interests Warren Zevon and his co-writer Jorge Calderon is the human cost of war. And so, the song is the words of one man to his wife or lover, a loving probable farewell from a man who feels honor bound to fight in a losing cause. Inevitably, when the forces of one nation invade another, it is the civilians of the native country who suffer the most. So it was in Veracruz, and Zevon and Calderon make this point brilliantly by making it personal. Cabaret is a word that can indicate a musical genre. Jazz singers who work with just a single accompanist or a small ensemble, and who perform programs of music organized around a single theme get this label. They tend to go for a musical style like Frank Sinatra, or late Ella Fitzgerald. There is nothing wrong with that, but it’s not what I mean. Think of the show and movie Cabaret, not so much for the sound as for the feel. You walk into a gloomy room, lit mostly by the spotlight directed at the stage, and filtered through a thick haze of cigarette smoke. On that stage is an assortment of musical instruments. Some are predictable, guitars, piano, stand-up bass, sax and trumpet perhaps. But there are some surprises in the mix. Is that a gypsy‘s violin? There, an accordion? Harmonica even? And maybe one or two you can’t identify at all. I don’t know if the artists I have chosen wear costumes when they perform, but in this place, the performers are extravagantly dressed. And then there is the music. The songs are almost familiar but elusive. At times, they seem to veer away from every rule you know about songwriting. And yet, in this place and time, it all makes sense, and it takes your breath away. There is a sense of otherness in this music, even a hint of danger and a splash of darkness. But, above all, there is fierce originality. Welcome to my cabaret. Get yourself a drink, and stay for a few songs at least. 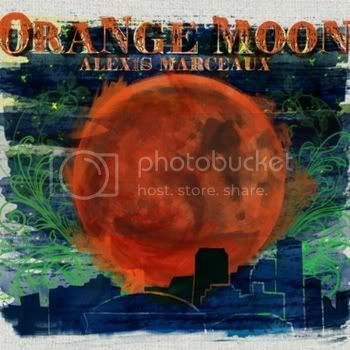 Alexis Marceaux is a powerful singer with a rich and emotive alto voice. Stars is a fine example of her work. The lyrics have an otherworldly feel to them, but it’s handled lightly. The arrangement is stunning. 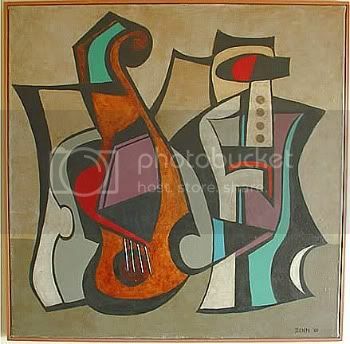 Marceaux, I believe, is using two fiddles here, but one is bowed and the other plucked. These join an acoustic guitar, drums, and bass. And then there is a moment in the middle of the song where everything except the guitar and voice drop out, and the song is rebuilt from there. All of this gives the song a unique feel, and it all serves the text of the song, about separation and yearning. I’m supposed to hate Tea Leaf Green. This album is a survey of pop styles, from the light reggae of It’s So Easy to Be Your Lover to folk, 60s rock, maybe even a dash of new wave. It’s all bathed in reverb, for that extra retro feel. 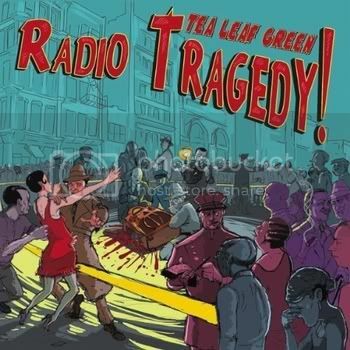 But Tea Leaf Green obviously love this music, while also approaching it with a knowing wink. And they take these diverse styles and get the album to make sense as a whole. There is a slight sense of melodrama here, enhanced by the wonderful illustrations on the cover and in the booklet. These illustrations are by band member Josh Clark, and they suggest a gangster story told in the form of a graphic novel. If Clark ever does do a graphic novel, I want to know about it. What does cigarette smoke sound like? It’s not a question that I would have thought to ask. But it sounds like Fellaheen’s song Always on the Way. The smoke suffuses Bruce Hanson’s lead vocal. It also oozes through the twin accordions that provide the musical cushion for this song. Listening to this, I imagine a Parisian café, filled with scientists and artists making secret plans. That may sound bizarre, but the musical setting here makes it entirely plausible. The Day the Devil Took My Happiness Away starts with a vibe that recalls the best versions of St James Infirmary. Soon there is haunted whistling, then chorused male vocals like some of the old big bands used to use, and even some horn parts that feel more like strings. And then it’s all done. This song passes quickly, but with a powerful effect. And all of those disparate elements add up in a coherent way. 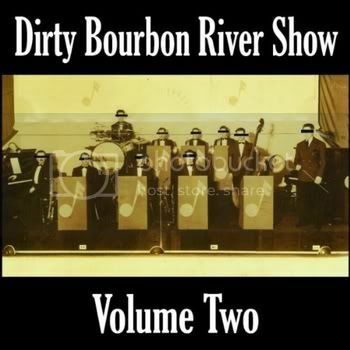 Dirty Bourbon River Show has this gift. Blues is the foundation for their music, but they can build from it in various ways, and it all works. Throughout this post, I have been talking about the arrangements, and the unusual uses of some instruments. 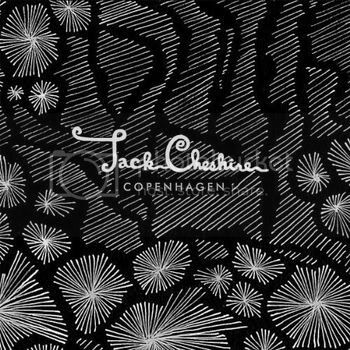 But Jack Cheshire makes the most from the least. The band here is just guitar, stand-up bass, drums, and lead and background vocals, with minimal overdubs. Yet the sound is as rich as anything else here. The bass sings, which helps. But mostly, it’s just great economical writing and arranging. Copenhagen feels like a combination of moving parts, gears catching gears catching gears. If you have ever seen a perpetual motion machine where all of the parts are exposed to view, you have an idea of the sense of wonder that this music inspires. Olinde Mandell is a type of performer who is rare these days; she can carry her delicate and beautiful songs with just her voice and guitar. For her debut album, she wants to add light production touches, including fiddle and backing vocals. On the evidence of her demo for Love Me Tomorrow, that is going to sound great. As I write this, Mandell is about half way to her fund raising goal with 13 days to go. If you can do anything at all, please help her go over the top, so this album can get made. Remember, this is a Kickstarter campaign, so if she doesn’t make her goal, she gets nothing. Thank you for what ever help you can give. The album title Boys For Pele has nothing to do with soccer. 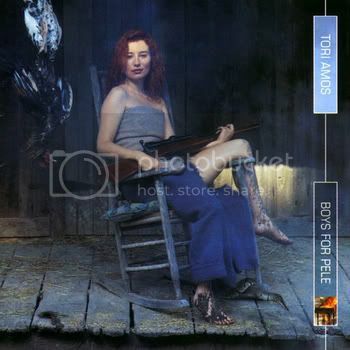 Like so many people, I first became aware of Tori Amos when her solo debut, Little Earthquakes, came out. Here was a set of songs by a woman who had been badly mistreated by the men in her life, and who was releasing years of pent up anger in her songs. Musically polished and emotionally raw, these songs featured Amos voice and piano, with only a bit of embellishment. Yes, there were strings, but the sound was still intimate. This couldn’t go on forever. At some point, Amos had to broaden her musical palette, and also her emotional range, or people would stop listening. And she did. Boys For Pele is Amos’ transitional album. Emotionally, she has talked about how she had to cast aside the various men who had hurt her, so that she could reach an emotional state where she could welcome love into her life. So each of the album’s songs is about one of these “Boys”, and Pele is the Hawaiian volcano goddess to whom Amos is symbolically sacrificing them. Musically, Amos started working with a band, particularly with bass and drums, and there are some unusual instruments in the album’s songs. This would lead Amos to the more muscular sound she is known for now. Talula [The Tornado Mix] is a key song in this development. Here a strong beat supports Amos’ lead on harpsichord. The combination shouldn’t work at all, but does. There are also horns on the song, used for accents. If you have an older edition of this album, you may be wondering about the “Tornado Mix” in the title. Apparently, this is not how the song was originally released, something I didn’t know until I researched this post. The strong beats were added in this remix, which has replaced the original version on more recent releases of the album. Amos apparently didn’t like the way the beats were done on this remix, and said that she would have rather done them herself. Since then, she has, and that has become a key part of her sound. I don’t have the original version of Talula. If anyone does, please let me know. I would love to add it to this post. 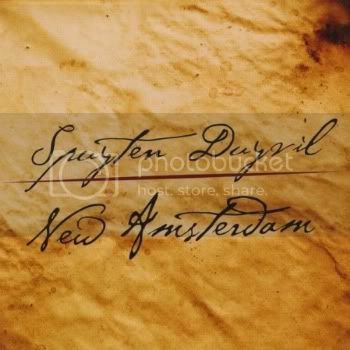 When I reviewed Spuyten Duyvil’s previous album a year ago, I noted that the band had just replaced their bass player and added a drummer and a harmonica player. Now, these new members are fully integrated into the band, and we get to hear what they sound like. James Meigs is the harmonica player, and he often plays Chicago style, which means that he places the harmonica directly on the microphone and gets that dirty, distorted sound that one hears in Chicago blues. Mark Miller can now write for a band with a tight rhythm section. So New Amsterdam is an album of folk, blues, even occasional old-time jazz and gospel flavors, but all delivered with a powerful rock kick. Beth Kaufman has the strong voice to put all of this over beautifully, and Miller, who takes more of the lead vocals than last time, is very impressive here as well. He has the power for an old-time blues number, (One Fine Day), but can also take a more subtle approach for a jazzy shuffle, (Through the Light). Overall, the affect is a wonderful blend of rock energy and jug band flavor and variety. There are two covers on the album. Things get started with a rocking Shady Grove. I’ve never heard the song approached this way before, but I challenge you to try to sit still for this one. Later, a perfect train rhythm starts up, and Beth Kaufman launches into a fine performance of Freight Train. After she completes the lyrics the first time, Mark Miller comes in with a song I haven’t heard before that I would call Angel, Lay Him Away. This then becomes a counter-melody, when Kaufman comes back in with Freight Train again. All in all, it works beautifully. The album cover lists ten songs, but there is also a hidden track that should not have been. Track eleven is just two minutes of silence, but then comes a song called Pride Packs Her Bags. This is a beautiful breakup song, filled with yearning. It is more acoustic than the rest of the album, so maybe that’s why it’s hidden. But don’t miss it. Mark Miller has a knack for writing original songs that sound traditional, and I certainly mean that as a complement. In particular, I actually searched on line to try to find an older version of One Fine Day. I was that sure I had heard the song before. These kinds of songs often have spare lyrics, with a lot of details left for the listener to fill in. But Miller also writes more modern songs, with more of the details in the lyrics. I was particularly impressed with Coal Train, Through the Light, and Peace With the Damage, as well as Pride Packs Her Bags. Coal Train depicts a weary soldier who must return to the war; the subject could easily be rendered as a political song, but here instead is a deeply human portrait. Peace with the Damage is a portrait of a woman who regrets the actions that have led to a breakup, but who can not yet take full responsibility and apologize. Through the Light has a story that is somewhat in shadows; a man is in the hospital for a life-threatening situation, but he considers his situation through a series of metaphors to avoid fully facing his fears. Miller finds characters in emotional flux, and he depicts them perfectly. I don’t know when was the last time I mentioned this many of an album’s songs in my review. New Amsterdam is a treat from start to finish. When I was younger, artists used to make albums to have something to sell, and to make money. Labels signed them for the same reason. Beyond that, there was and still is the desire to get the music out to as many people as possible. Nowadays, most artists probably don’t make much from album sales. But someone who buys a CD at a gig might play it for a friend, and the friend might be at the next gig as a result. I hope that sending a CD to me means that someone might hire an artist for a gig who they wouldn’t even have heard otherwise. But sometimes, there are other reasons for making a CD, reasons that transcend business considerations. Someone gets an idea that demands their attention, and nothing else can happen until the album gets made. Often, these ideas become themes around which the albums are organized. The music is often a passionate reflection of this. These kinds of albums are the special projects in my title. Let’s check some of them out. Kevin Faherty is an extreme example of a songwriter’s songwriter. By this, I mean that his songs are known and admired by other songwriters, but almost unknown to everyone else. Faherty seems to have decided that he does not want to sacrifice the purity of his art by making albums, and I’m not even sure that he performs in a formal setting very often. But a large number of other songwriters have gotten to know Faherty’s songs from his appearances at campfires at the Kerrville Folk Festival. One of these is Darryl Purpose. Purpose put together the album Singer-Songwriter Heaven as a sort of musical surprise party for Kevin Faherty, who apparently knew nothing about it until the album was close to completion. Purpose has gathered eighteen other artists who know Faherty and admire his work, and gotten each one to record a different Faherty Song. Each artist was apparently left to determine how they wanted to treat the song. So some of the artists here have done simple arrangements with just guitar and voice. Others, like Purpose, have chosen to do full arrangements with a band. All have respected the reason they are here, the song. Faherty emerges as a writer with humor, warmth, and sympathy for his characters, not prone to cliché, and fine at his craft. 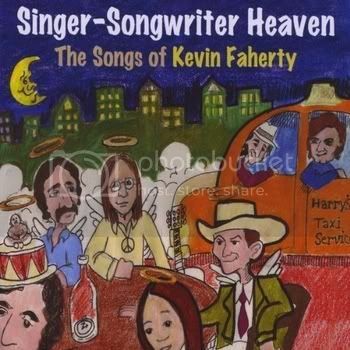 Given that Faherty has shown no desire to make his own album, Singer-Songwriter Heaven can be taken as his debut, or as a tribute. Either way, it’s a fine introduction. Spottiswoode: Where Do I Come In? 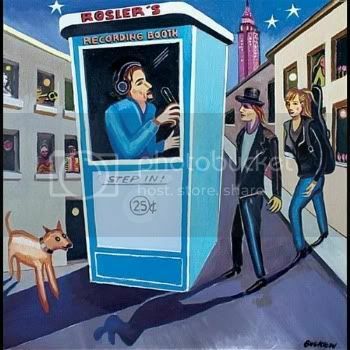 Rosler’s Recording Booth is also a multi-artist compilation, but of a very different sort. New York City used to have recording booths in key locations that attract tourists, notably Coney Island and the Empire State Building. A person or group would put a quarter in the slot, enter the booth, and record a spoken, (or sometimes sung), message. When they were done, a vinyl record would pop out, which could then be sent to a friend or loved one. Don Rosler was able to obtain at least 16 of these records, probably more, and these old messages became the inspiration for the songs heard on this album. Rosler decided that he didn’t want to perform all of the songs himself, so he brought in some help. In all, ten artists or groups perform these songs, and each brings a different sensibility to the table. But the inspiration for these songs means that there is a common theme, that of separation and longing. Rosler has interesting ideas about orchestration, which all of the artists here follow to a greater or lesser degree. So there are surprising combinations of instruments and tonalities, but it all works beautifully. Spottiswoode’s take on Where Do I Come In? brings it all together for me. The arrangement here is startling, with sudden shifts in mood and tonality. Don’t judge this one until you’ve heard it all the way through. But all of these changes are not simply for show. The emotion of the song comes through loud and clear. There are many other fine performances on this album. I want to know more about Spottiswoode, and also about Terry Radigan, who contributes four wonderfully varied performances here. Other listeners will find other gems as well. 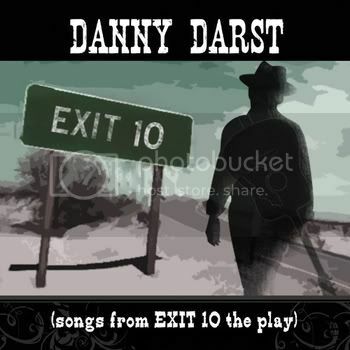 Exit 10 marks the debut of Danny Darst, not only as a musician but also as a playwright. And this one has been brewing for a long time. One of the songs here is a cowrite with the film director Robert Altman, who died five years ago, and to whom this album is dedicated. Darst has been an actor on stage and screen, and he has written songs that other people have made into country hits. He performed some of his own songs in the films Something Wild and Melvin and Howard. But it took becoming a playwright himself for Darst to release a full length album of his own songs. Darst proves to be a wonderful storyteller, with a weathered voice that is perfect for his tales of the open road, and of the connections and disconnections that are made there. Is No Responsibilty an example of a connection or a disconnection? I will leave that question to each individual listener. Look at a map of Miineapolis, MN, and you will see what you see in most maps of cities. The streets are close together, but as you zoom out, you find a borderland where the space between streets starts to grow. As you move northwest from Minneapolis, that borderland is a place called Osseo, and there you will find the Yellowtree Theatre. The Yelllowtree bills itself as an integral part of the community, and that means that they like to put something special into their productions. 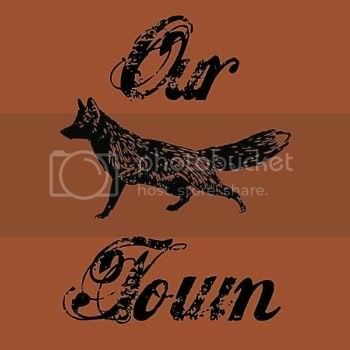 For a recent production of Thornton Wilder’s play Our Town, that meant the folk music performances of Blake Thomas and Mary Fox, collectively known as Thomas Fox. The album Our Town is simply a collection of those performances. Most of the songs are traditional, with one original and two covers. The music is entirely acoustic, and this is folk music as I first heard it. It is the sound of two people celebrating the beauty of some great old songs with honest and heartfelt performances. 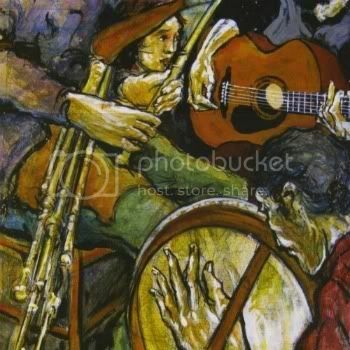 I believe there are some overdubbed instruments, but it sounds like a gathering on somebody’s back porch. Hopalong Peter has a jug band feel that I thoroughly enjoyed. A straight ahead folk sound is more typical of songs here, such as the standards Wildwood Flower and Banks of the Ohio. Other songs are less well known, but just as beautifully rendered. My last example of a special project grew out of a birthday present that was set aside. Liz Queler’s mother-in-law gave her a book of poems by Edna St Vincent Millay. Queler says she was “never much of a poetry reader”. She only picked up the book at all to try to cure a case of writer’s block by setting one of the poems to music. What was supposed to be just an exercise soon became an obsession. First Queler, and soon her husband Seth Farber as well, began to research Millay’s life and work, even visiting the house the poet once lived in, and going to sites where she wrote some of her poems. 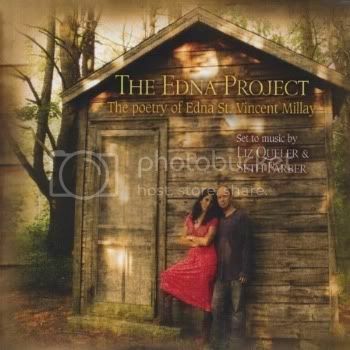 Ultimately, Queler and Farber created an album of 21 of Millay’s poems set to music, and given beautiful performances. There is a lyric sheet, and it’s hard to believe that these words weren’t written as songs in the first place. You would hope that such an obsession would result in heartfelt performances, and it does. Some songs are set for just guitar or piano and voice, while others, like The Betrothal, feature a full band. So the album presents a wonderfully varied listening experience as well. 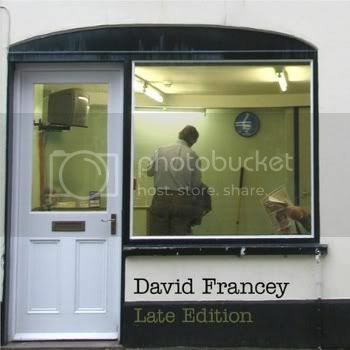 Based on the example of his new album, Late Edition, David Francey is an economical man. By that, I mean that he uses only as many words and as much music as he needs to make his point. The twelve songs on Late Edition run about a half hour total. There are solos, but nothing flashy, and the arrangements of this music are little marvels of efficiency. Make no mistake, Francey is a man of deep feelings and strong opinions. He just doesn’t need a lot of space to show it. Francey sings in a somewhat scratchy baritone. All of the songs here are either Francey originals or co-writes of his, but on Late Edition, he does not play an instrument. I probably wouldn’t either if I had a band that included Kieran Kane, Fats Kaplan, and Richard Bennett. Drummer Lucas Kane has a most unusual role here. Bennett plays acoustic or electric guitar, except for his beautiful bouzouki part on the song Wonder. His electric guitar playing has an acoustic quality, and is mainly used to vary the sound and texture of the music. Kieran Kane, who also co-wrote three of the albums songs, contributes banjo, guitar, and mandolin parts. Fats Kaplan usually adds tasty fills with his fiddle, but he switches to a beautifully subtle accordion part on Wonder, and picks up an electric guitar and rocks out on I Live in Fear. It would be easy to miss the drums, except on I Live in Fear. Usually, Lucas Kane adds just a whisper of a bass thump to the songs here; the effect is an almost subliminal heartbeat. There is no conventional rhythm section on these songs, and no bass player. The songs range from ballads to ragtime influenced up tempo numbers, and the subtle shifts in texture make Late Edition a richly varied listen. I’m using the word subtle a lot here; it is the hallmark of these songs. The musical arrangements place an emphasis on the words. Francey grew up in Scotland, leaving for Canada when he was 12, and the accent is very much there, but his words are clear. Francey’s lyrics set moods and feelings, but they don’t tell stories. Instead, these are beautifully sketched slices of life, and they rely on both the music and the listener’s imagination to fill in the details. Pretty Jackals is clearly concerned with the Crucifiction, but you have to get to the last verse to see what Francey has done here. Then you realize that he has imagined how the Crucifiction would be reported today on the TV news. Wonder and Grateful are powerful evocations of love, from two different angles. Solitary Wave and Borderlands are mood pieces based on contemplations of the natural world, and in each case, I can see the scene in my head as I listen. And Blue Heart of Texas is a song that snuck up on me. When I started working on this review, I did not think that I would be posting Blue Heart. But its depiction of the loneliness and yearning of a musician on the road won me over. I should mention that the song as written does not have to be about a musician at all, but that is where it takes me when I listen. As I said earlier, the listener winds up filling in the details of these songs, so your experience of this album may be different than mine. But I can promise you that these songs will take you somewhere, and that the trip will be well worth it. When people talk about Merle Haggard, the phrase “country music legend” comes up. And why not? 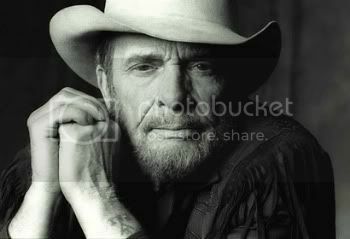 Haggard began his recording career in 1963, I think, and he had 38 number one hits on the country charts. And he wrote at least one definite classic, Mama Tried. But the great secret about Haggard is that he is still at it. Mainstream country music passed him by about twenty years ago, but he keeps doing what he has always done. These days, his music would be considered alt-country, which is a shame. By 2001, Haggard was already out of the mainstream. That year, he released the album Roots Volume 1. This is Haggard’s tribute to the songs and artists that influenced him early on. Haggard included three originals, to put his sound in context. The only other artist represented by more than one song is Lefty Frizzell. If You’ve Got the Money is the best known of these. Haggard in 2001 didn’t have the vocal power of his younger days, but he put what he had to the best use. Haggard also found a great set of musicians to bring out that 1950s country sound. For my money, Rascal Flatts, for one example, is a southern rock band, and this is what real country sounds like. Here in the United States, Independence Day is an occasion to celebrate the birth of our nation. 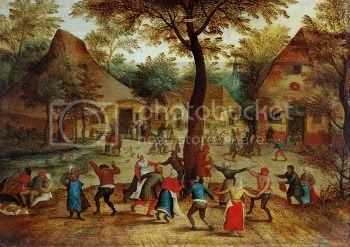 Of course, we were originally British colonies, and early settlers came, not only from England, but also from Ireland and Scotland. The music of these early settlers was our first music, and it would form the foundation of American folk music. That foundation is very much in place today. Here are five artists, four Americans and one Canadian, whose music reflects this musical heritage in one way or another. Traveler’s Dream is the duo of Denise Wilson and Michael Lewis, and they have made a point of preserving the music of these early settlers. Their mix also includes French songs. Black Cavalry shows a strong Irish influence, including the wonderful interplay between the guitar and bouzouki. But I think of the concertina as an English instrument. So the song probably reflects the intermixing of cultures that would lead to the development of a uniquely American sound in time. In any case, this performance of Black Cavalry is no museum piece. 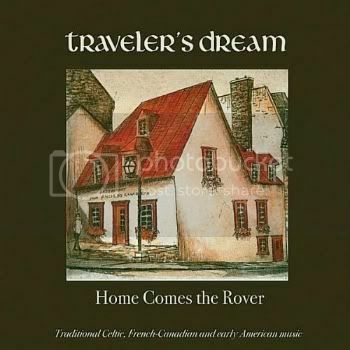 Traveler’s Dream bring the song fully to life with their energy and talent. I should also note that Denise Wilson has a wonderful singing voice, although it is not heard here. 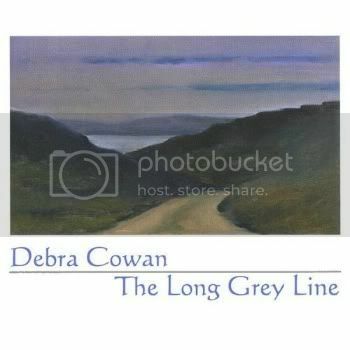 Debra Cowan also presents a wonderful mix of Irish, English, and American music. Her blues version of Darling Corey may sound like a scary idea, but it really works. But I settled on The Long Grey Line because it is a Scottish song, so it fills out the set nicely. The song sounds traditional, but it is actually the work of contemporary songwriter Alan Hunter. A tinker, if the term is new to you, is another word for a gypsy. This song beautifully captures the conflict between the yearnings for freedom and stability, and Cowan’s performance is perfect. 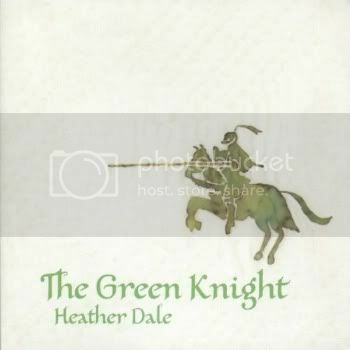 Heather Dale writes her own songs, but they are very much in the tradition of English folk music. Her arrangements are another matter. Dale freely mixes modern and traditional influences in her music. The Maiden and the Selkie begins with a drone played on a synthesizer, then adds bodhran, guitar, and eventually whistle. The tale is one that could be told anywhere in the coastal regions of the British Isles, and the selkie, a seal man, is a folkloric figure known throughout Britain. Dale gives the song a haunted quality that suits the tale perfectly, and her singing also captures the romantic yearning that is essential to the tale. Robert Sarazin Blake is an American folk artist, and his guitar playing has as much to do with rock as it does with traditional Irish music. Blake’s voice has a rough quality that contrasts with the smoother stylings of most of the Irish singers I have heard. 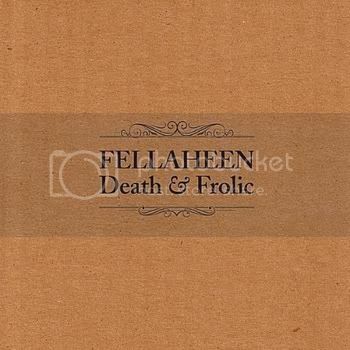 But this album was made in Belfast with Irish musicians, including piper John McSherry. It turns out that the two musical forms complement each other beautifully here. Storms of November has both power and poignancy, and is the best of both worlds. 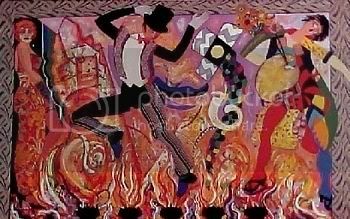 Kyle Carey is a modern folk artist, with just the hint of an Irish accent. 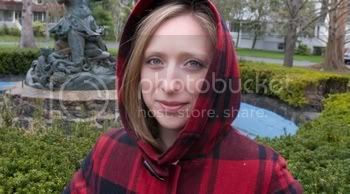 Her arrangements feature her beautiful alto voice and her fine guitar playing. 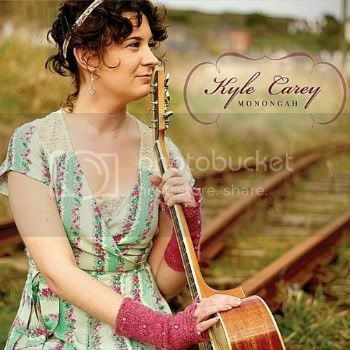 Her songs tell stories in an Irish manner, but her subject matter is American, with particular emphasis on the South. The exception to this is one song sung entirely in Gaelic. Monongah is a town in West Virginia where a mine explosion took the lives of 362 men and boys in 1907. The song is set in a present day that is haunted by these long ago events, and Carey captures the emotions of this perfectly in her performance. It’s funny how this works sometimes. 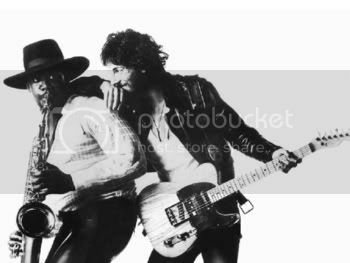 I noted the passing of Clarence Clemons this past week, and I really wasn’t thinking about posting anything here. I have lived in New Jersey all my life, and I was fifteen when Born to Run was released. But I never took to Bruce Springsteen with the near religious zeal that many of my fellow Jersey residents did. Don’t get me wrong, Born to Run is a great album, and Springsteen is a great artist. I heard Born to Run not long after it was released, and I came to know the album well because one of my brothers bought it. But I never owned a copy, and it was the only Springsteen album that ever lived in our house. Having said all of that, here is my post of Tenth Avenue Freeze Out. What happened? Funny you should ask. This evening, my family and I went to see some fireworks. You know how this goes, for fifteen minutes of fireworks, you get to sit through four hours of festivities, including the dreaded cover band. Actually, this one was about as good as they get, doing competent versions of everything from Disco Inferno to Honky Tonk Women. Oh, and Tenth Avenue Freeze Out. And, listening to this, I began to write a post in my head about why the original was so much better. And this is not that post. I was going to talk about how Clarence Clemons was such an essential part of that band, that album, and that song. How Springsteen, Clemons, and the rest of the E Streeters captured the essence of rock and roll for one brief moment. But I got home and I listened to the song. Two things struck me immediately. The outstanding thing about the song and the album is not the rock and roll, but rather the soulfulness of the music. This music is heartfelt and honest, at a time when so much popular music was based on artifice. This is rock music, but the arrangement, with its use of keyboards and horns, owes a great debt to classic R&B. The other thing that struck me is about memory. I can hear in my head that big sound that Clemmons always got from his sax, squealing away solo throughout the song. But that’s not how the song goes. Clemmons does his part as part of a horn section, soloing only for a few notes in the middle of the song. Over the years, the other horns had disappeared in my memory, but there they are. So now I once again know what Tenth Avenue Freeze Out sounds like for real, and it’s great. But I can’t guarantee that it won’t change in my memory again going forward.